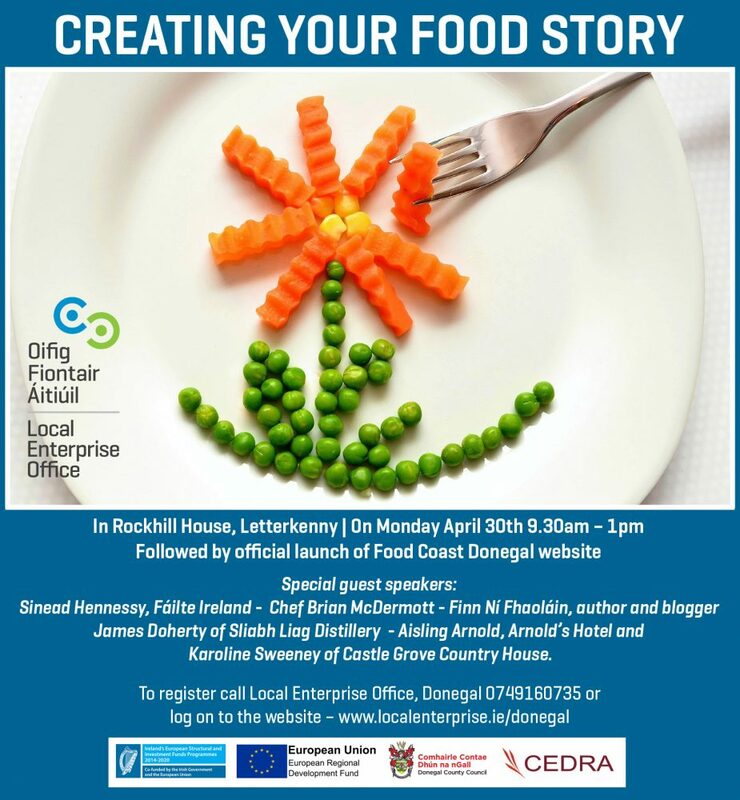 Food businesses in Donegal will get an amazing opportunity to hear why and how they should craft their own ‘food story’ at an upcoming seminar in Rockhill House, Letterkenny, on April 30, hosted by Local Enterprise Office, Donegal through its Food Coast initiative. Six speakers will give insights, hints and tips at the seminar that runs from 9.30am until 1pm and will be followed by the launch of the new CEDRA-funded Food Coast website and a networking lunch. Sinead Hennessy, Food Tourism Officer at Fáilte Ireland; Brian McDermott author and celebrity chef; Finn Ní Fhaoláin author and blogger; James Doherty Managing Director at Sliabh Liag distillery; Aisling Arnold from Arnold’s Hotel and Karoline Sweeney from Castle Grove Country House, will all speak at the event sharing experiences and knowledge that will hugely benefit any food business in the county. “More and more businesses have come to understand that creating a story for their business and product is a powerful way to connect with their customers and communicate the best qualities of what you have to offer them, said Head of Enterprise in Donegal, Michael Tunney. “The Food Coast has become a central platform for establishing Donegal as a “Food County” and a place with a vibrant food culture and food economy. We are keen for our food businesses to have the tools they need to ensure they can communicate that to a wider audience,” he said. Fáilte Ireland’s Sinead Hennessy will talk on the day about how businesses can develop immersive and memorable food experiences while Celebrity Chef and author of the cookbook Donegal Table, Brian McDermott will explain how businesses in Donegal can create a unique and authentic food story for their business. Author, chef and marine scientist Finn Ní Fhaoláin is a champion of Donegal food and the Wild Atlantic Way. Finn will share her own experience of developing a cohesive food story and will provide practical tips and ideas for developing a story. She will also discuss utilising social media channels to connect with customers, peers and followers. Founder and Managing Director of Sliabh Liag Distillery James Doherty will explain how he has developed the brand and story behind An Dúlamán, Ireland’s first Maritime Gin while Aisling Arnold, Manager and Owner of Arnold’s Hotel in Dunfanaghy will give an insight into how they champion Donegal food. Karoline Sweeney, Manager of Castle Grove House Hotel will talk about how they provide guests with a taste of Donegal and will also give insights into how to organise a Food Coast experience and the role such events play in allowing them to engage with their guests. Food businesses will be invited to submit ideas for their own Food Coast experiences, while the official launch of the new website will mean businesses and consumers interested in learning more about the food offering in Donegal will, going forward, have a source of information at their fingertips. “The vision of The Donegal Food Strategy is to collectively work to make Donegal famous for food and to make Donegal recognised as a pioneering region for its approach. The seminar and launch of the website are just the latest strides made towards making that happen and we look forward to seeing our Donegal food businesses respond positively by coming in numbers to this event,” Michael Tunney added. Businesses in the food sector, producers and food service businesses are invited to attend the ‘Creating Your Food Story’ seminar by registering at www.localenterprise.ie/donegal or calling the Local Enterprise Office on 074 9160735. Local Enterprise Office Donegal is supported through co-funding from the Irish Government and the European Regional Development Fund 2014 – 2020.